Corner Inlet is one of the most unique natural wonderlands in Australia supporting outstanding environmental values. It is listed as a wetland of international significance under the Ramsar Convention. Corner Inlet is home to the amazing marine and coastal parks of Corner Inlet and Nooramunga, as well as the unique intertidal mudflats and barrier islands west of 90 Mile Beach. The area has significant cultural value to the Traditional Land Owners, the Gunaikurnai, Bunurong and Boon Wurrung people. 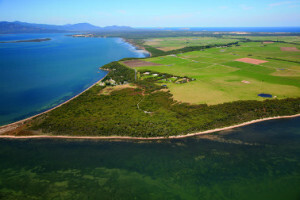 The Corner Inlet Connections program is funded by the Australian Government to address the critical threats impacting the site. an important destination for recreational activities including boating, fishing, camping, bird watching and bushwalking. The estuaries and wetlands that fringe Corner Inlet are fed by fresh water from the Franklin and Agnes rivers and many small creeks. erosion and land use change in culturally significant areas. Land uses in the catchment contributing to sediment and nutrient loads entering waterways include farming, forestry and urban development. Because the waterways at the western end of Corner Inlet are smaller, steeper, have erodible soils and are in a high rainfall area they are more susceptible to the impacts of these land uses. 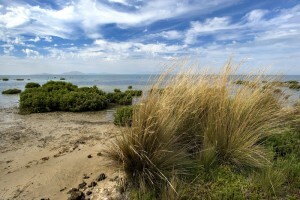 Seagrass meadows and the unique sand flats are most at risk. Weeds and pests such as Spartina (also known as rice grass), blackberry, foxes and rabbits compete with native plant and animal populations.When one species is impacted on, there are flow on effects to all the other species in the ecosystem. Indigenous Australians have a strong cultural connection to country and so the preservation of cultural heritage is extremely important. All sites found on public or private land need to be protected. The same land uses impacting on catchment and inlet health also threaten cultural heritage. Over the past five years the Australian Government has provided one million dollars to improve our understanding of water quality issues in Corner Inlet enabling us to plan and work with the most up to date research. The Corner Inlet Water Quality Improvement Plan (WQIP) was completed in 2013. The plan guides funding and on-ground actions for eight years to significantly improve the quality of water (sediment and nutrients) entering Corner Inlet from the surrounding catchment. The plan emphasises working with local communities to achieve outcomes. The Regional Waterway Strategy, completed in 2014, plans more specifically for the protection of the ecological character of the Corner Inlet Ramsar site. it covers issues such as protection of migratory and resident shorebirds, along with critical habitats such as seagrass meadows, mudflats, salt marsh and mangroves. The Corner Inlet and Nooramunga region is significant to the Gunaikurnai people, the Bunurong people and the Boon Wurrung people. There are many areas within the Corner Inlet and Nooramunga area that have significant cultural value to the Traditional Land Owners. In 2010, the Federal Court determined under the Native Title Act 1993 that the Gunaikurnai people hold native title over much of Gippsland, encompassing parts of the Corner Inlet and Nooramunga area. In addition to this, the Gunaikurnai people have entered into an agreement with the Victorian Government under the Traditional Owner Settlement Act 2010, which formally recognises them as the traditional owners over land within that area. The determination and agreement area extends from West Gippsland near Warragul, east to the Snowy River and north to the Great Dividing Range and includes 200m of sea country offshore. We acknowledge the Aboriginal Traditional Owners of the Corner Inlet catchment and recognise their connection to their ancestral lands and waters. We work very closely with Traditional Owners on all projects and we are developing relationships around Work on Country Projects. There is a strong history of natural resource management and on-ground works in the Corner Inlet region under the brand ‘Corner Inlet Connections’. Through this brand we worked with our partners on community awareness raising campaigns to highlight the connection between the health of the catchment and the health of the Ramsar site. a range of monitoring activities including habitat mapping in Corner Inlet, water bird counts and water quality monitoring. 250 hectares of blackberry control by Yarram Yarram Landcare Network on public and private land along priority waterways. These projects were complemented by a range of media, communications and community events including newsletters, press articles, canoe tours, field visits and community days. It is a priority of the Corner Inlet Connections Project to ensure the local community is involved in protecting and enhancing Corner Inlet. You are invited to follow the Corner Inlet Connections Partner Group on local social media platform Sustainability Gippsland to learn more about Corner Inlet and what is being done to enhance and protect it. Please contribute your own ideas, photos, stories, and ask questions. You can also sign up to our our quarterly and view past editions here. working with landholders to revegetate and fence waterways, and restore eroded areas like landslips and gullies. On-ground work can occur in all areas except for Muddy Creek, sections of the Franklin River and sections of the western tributaries. If you are interested in getting involved visit our Landholder Programs page. development of Soil Erosion Management Plans (SEMPs) with landholders. fencing, weed control and revegetation of saltmarsh and mangrove sites through South Gippsland and Yarram Yarram Landcare Networks. 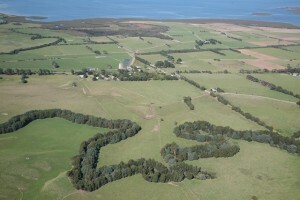 surveillance and fox control within the Ramsar site (ie Barrier Islands) by Parks Victoria. landcare networks working with landholders fringing the Ramsar site to increase levels of fox control on private land, and establish action groups. working with Traditional Owners on Work on Country projects and cultural heritage training and site assessments. increasing community awareness and participation through field days, workshops, and case study development. You can find out more about our news and events in the News section of our website. enhanced capacity of indigenous communities to protect natural resources. Protecting the Catchment and protecting the catch! For the latest news and information on all of our projects please subscribe to our Catchment Snapshot Newsletter. 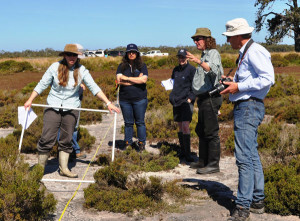 See a snapshot of the achievements of the Corner Inlet Connections project in the National Landcare Program Five Year Overview 2013 – 2018.